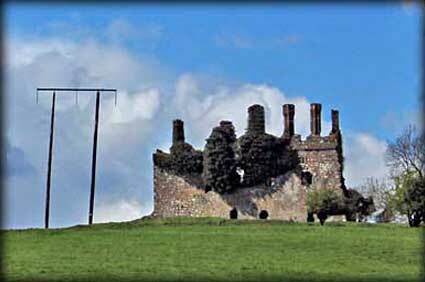 I had driven by Carbury Castle on many occasions in the past wishing the weather was kinder. Today appeared to be just perfect. Carbury Hill, aka Fairy Hill, is steeped in Irish history from the Bronze age right through to the 1798 rebellion. 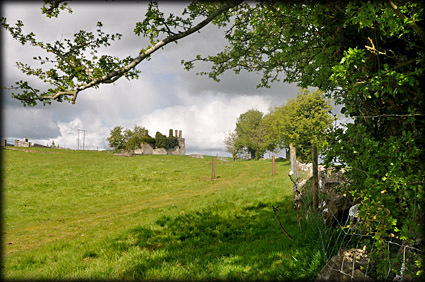 Located on the hill are two barrows dating to the bronze age and just behind the mansion (see image above) is a Norman Motte reputed to have been constructed by Meiler Fitzhenry who was granted the area by Strongbow. There is also the Mansion house, a Church, a Graveyard and a Mausoleum. The land was acquired by de Berminghams a Norman family in the 14th century, who may have built the oldest part of the existing castle. 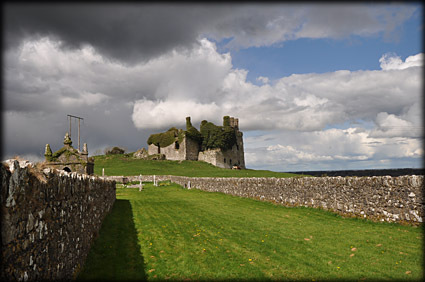 The castle was taken by the native Irish in the early 16th century before being granted to the Colley family (ancestors of the Duke of Wellington,) in 1562. The Colleys were responsible for the major additions to the castle. In the 17th century a large extension to the east of the building included the four prominent chimney stacks and large mullioned windows. In the graveyard to the south of the castle are the remains of Teampall Do-Ath and a 19th century Colley family Mausoleum. Before I could make it to the interior of the castle I was caught in a huge downpour and had to take shelter in the archway of the church, maybe next time. Situated: If you head into Carbury from the east take a right turn at the Castle Inn. Drive straight up to the top of the road passed the Church. Park here and go through the gate. Watch out for cattle. Discovery Map 49: N 6863 3510. Last visit April 2012.